Plus: Which Is The Best Section Of The Ecuadorian Coast? 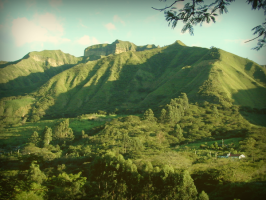 A number of years ago, I bought a terrific property in Vilcabamba, Ecuador, from a friend. It was a good-sized parcel of land with a simple home and a guest cottage… and over 150 feet of river frontage. With a bounty of tropical fruits, coffee plants, and surrounded by beautiful mountains, it was a real paradise. One of the trickiest aspects of property investing overseas is verifying that you’ve got a clean title. In North America, this is something we take for granted. But overseas, ownership laws vary from one country to the next and can even vary between regions of the same country. So before my next property purchase, I decided to get smart about titles in Latin America. Here are a few samples of what you’ll find with some important watch areas. A freehold title, sometimes called “fee simple,” is the highest form of property title. This is the one you want. Originally from English law, the term means you have absolute title to land free of any other claims against the title, and that you can sell it or pass it on by will or inheritance. It’s the norm in the United States and Canada. Freehold titles provide the only absolute form of property ownership, and, generally, it’s the only form of land title that I’d recommend. In Latin America, the freehold title is often called cuerpo cierto in Spanish or corpo certo in Portuguese. Rights and shares (Derechos y Acciones) is a term you’ll see on some Latin American titles, and it should throw up a red flag. What this means is that you’re buying someone’s “rights” to the property (or their share of the property) rather than the entire property as a whole. Normally, it’s someone’s inheritance… and it’s what I bought on the river in Ecuador mentioned above. Buying property this way can work for you if you’re sure that you have all the rights from all of the heirs. In that case, you can change it to a normal title. But if you miss an heir, you may find yourself sharing the property with an unintended partner. I successfully converted my title in Ecuador to a freehold title, but I was lucky… and it’s a gamble I’m not likely to make again. In the future, I’ll make the conversion to a freehold title a condition of the sale to be met prior to closing. A concession title means that you have documented use of the land, normally for a specified period of time. You generally have the right to occupy the land, improve it, build on it, and, in many cases, pass it on to your heirs. Most often, concession titles are granted by governments for coastal land. Essentially, it’s a form of lease. But you don’t own it outright or unconditionally. Concessions are used in many parts of the world, and there is a wide variation in how they are administered by the respective governments. In some areas, it’s the most common form of beachfront ownership. Be advised that when title checks are performed, local attorneys will often consider a concession title to be a good or “clean” title when it has no liens against it. It’s up to you as the buyer to ask if it’s a concession and decide if this is how you want to hold the land. Land on a concession title can generally be bought and sold like a freehold title, and it often stays in the same family for generations. I don’t personally know of any case where a government has revoked a concession and evicted the occupant… but it’s permitted by law. In these cases, the government will typically reimburse the occupant for his improvements on the land. Rights of possession—or, more commonly, adverse possession—is another way of holding a property in Latin America, but it’s not a title. When you hold rights of possession, you have been granted the right to occupy or use the property, but you don’t own it… you can’t sell it… and there’s no guarantee that you’ll keep it. In Spanish, this is often called derecho posesorio. Generally, these rights cannot be passed on. This may be fine if you’re going to put up a shack to use as a beach bar… but not where you’d put your dream home. Rights of possession, under various forms, are generally granted by the government. Sometimes this is done to encourage people to farm the land, or to otherwise use it productively, without granting ownership. You’ll see this commonly in Bocas del Toro in Panama. It can be called cooperativa land in other countries… and ejido land in Mexico. Unlike concessions, rights of possession are more transient and subject to adverse claims. In simple English, this means that the right to possess the land was obtained because someone laid claim to it after occupying it for a time, perhaps as a squatter. The amount of possessory time varies from one country to another. I’ve seen “occupation times” as short as 2 years in some countries, and as long as 12 in others, before one could ask for a possessory title. A possessory title is not necessarily a bad title, but it can be. In Nicaragua, for example, there are cases where possessory titles were granted to individuals who filed claims against the government. If this happened after 1917, it’s not valid… and there’s no statute of limitations. In many countries, a possessory title can never be converted to a freehold title. When buying property in Latin America, it’s critical that you have a comprehensive title review performed in accordance with the laws of the country you’re buying in. You’ve got to engage a qualified local attorney. A local real estate attorney will be experienced in finding liens and judgments and will know the types of local problems to look for. Title insurance is a way to protect yourself even further against a bad title. With title insurance, you’re actually insured against future claims and property loss, including legal defense against title claims. But residential title insurance is difficult to find these days, and, where available, it’s expensive. Several countries have a US$10,000 minimum premium, and others have minimum policy values from US$1 million to US$2 million. Panama and Costa Rica are exceptions, with a minimum policy value of US$150,000 as of April 2014. The main companies remaining in business are Stuart Houston and Chicago/Fidelity. I’ve bought many properties in the United States and have never used an attorney… because I understood my rights under the law and was familiar with the controls applied to the real estate business. But I won’t do that in Latin America and don’t recommend it for anyone else. Before signing on the dotted line, be sure to verify that the land is titled securely and have the title researched by a qualified individual. Aside from a possible investment in Brazil, I am also looking for a beachfront condo in Ecuador. Any suggestion as to whether I should be looking toward the north up by Esmeraldas… or to the south by Guayaquil. Please let me know. I like both the north and the south ends of the Ecuadorian coast, though I don’t like the city of Esmeraldas proper. But the areas south of Esmeraldas city—from Tonsupa through Atacames, to Súa and Same—include a number of nicely developed beach resorts, each with its own special character. This stretch has some nice beaches and good rental opportunities. Vacationers here come from Quito, rather than Guayaquil and Cuenca. At the south end, Playas and Salinas are good choices. The southern resorts have the advantage of being significantly closer to an international airport (at Guayaquil)… and Playas has the further advantage for investors, as it’s a newly developing area. Follow this link to see my report on Playas. Also, don’t forget Manta on the central coast. It’s the coast’s largest city and has convenient air service to the international airport in Quito. Do Corrupt Countries In The World Affect Their Expats?